← When Is It OK To Hack? 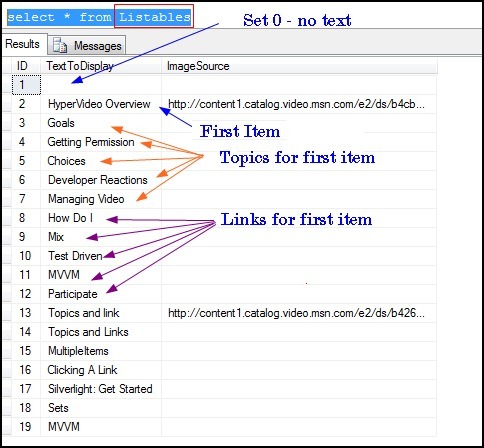 The Listables table’s relationship with the other three is isomorphic to the relationship between the Listable base class and the derived classes Item, Topic and Link. All of this is captured in the database diagram shown above. 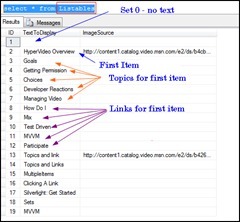 The Sets, Items, Topics and Links tables each represent part of an object, with the remaining part held in Listables. This “normalization” of the database reduces the duplication of data, and thus reduces the likelihood of database corruption. 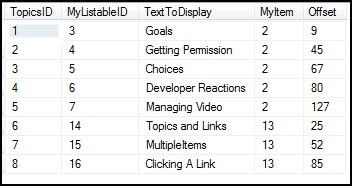 As shown in the image, the column MyListableID in Items and the column ID in Listables are used to join the two tables together into a complete Item. 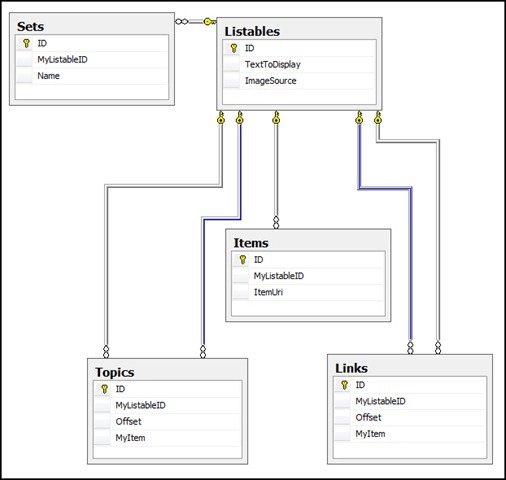 The second set of connections from each of Links and Topics to the Listables (colored blue) represent the has a relationship from Items to Topics and from Items to Links. Thus, the database has captured all the object relationships, but has translated it into relational terms. The next step is to use the Entity Frameworks to translate back to objects, and WCF RIA Services to create those objects both on the database server and on the Silverlight client. We will have course have authoring tools for adding this information to the database, but for now let’s add it by hand. Note that each of the three topics is entered in two parts, the Listable and the Topic. We would then enter the topics and links for the first item as well. That is, in fact, exactly what we see. Each entry has a unique ID (in this case an integer, in a future release a GUID). Entry 1 is the Set (which has no text or image). Entry 2 is the first Item we entered. Entries 3-7 are the Listable parts of the Topics for the first item and entries 8-13 are the Listable parts of the Links for the first item. Note that Listable ID 13 represeents the second item, and that is followed by the Listable parts for the topics and links of the second item. 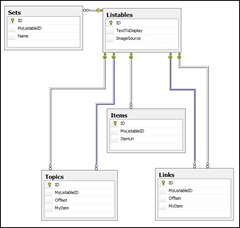 To see these relationships, we can query the TopicsView to see that the database has captured the Text to display, the offset (in seconds) of where to jump to if a topic is chosen, and the relationship between the Topic entry, its own Listable entry, and the Listable entry for the Item that the topic relates to. Finally, Offset is the number of seconds into the video that clicking on the topic will scrub to. This entry was posted in Mini-Tutorial and tagged Opinion. Bookmark the permalink. existe uma forma de rever e-mais antigos deletados pelo hotmail, tenho documentos importantes que preciso recuperar.